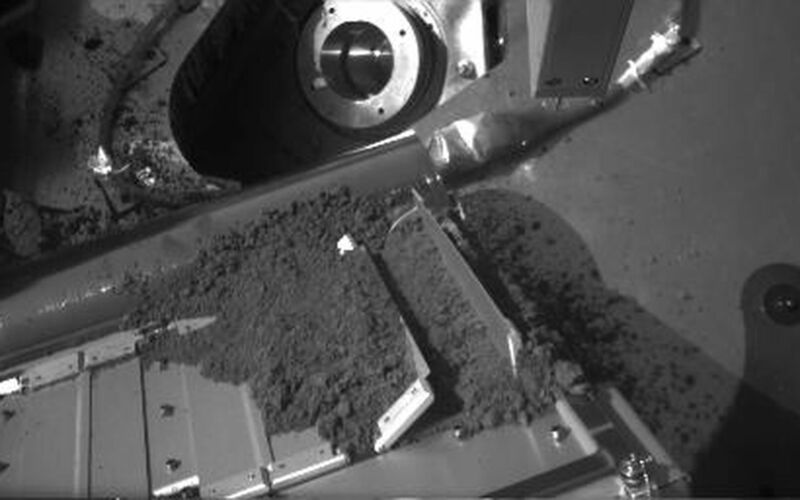 In both images of this before-and-after sequence, a sample of Martian soil rests on a screen over the opening to one of the eight ovens of the Thermal and Evolved-Gas Analyzer instrument (TEGA) on NASA's Phoenix Mars Lander. Between the times at which the lander's Robotic Arm Camera took these images during the mission's 14th Martian day after landing (June 8, 2008), TEGA vibrated the screen for about seven minutes. The TEGA oven doors are on a surface sloping at about 45 degrees, with the top of the doors near the lower edge of these images. 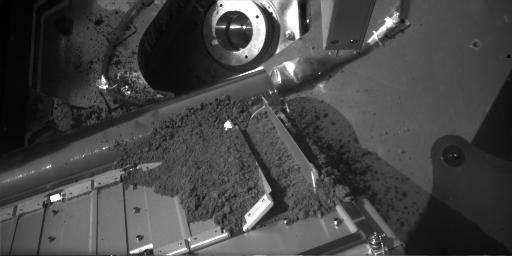 The downhill direction on this part of the instrument appears upwards in the image. The screen-covered opening for the oven intended to analyze this soil sample is between the vertically positioned door at the right end of the series of doors and the partially opened door to the left of that one. 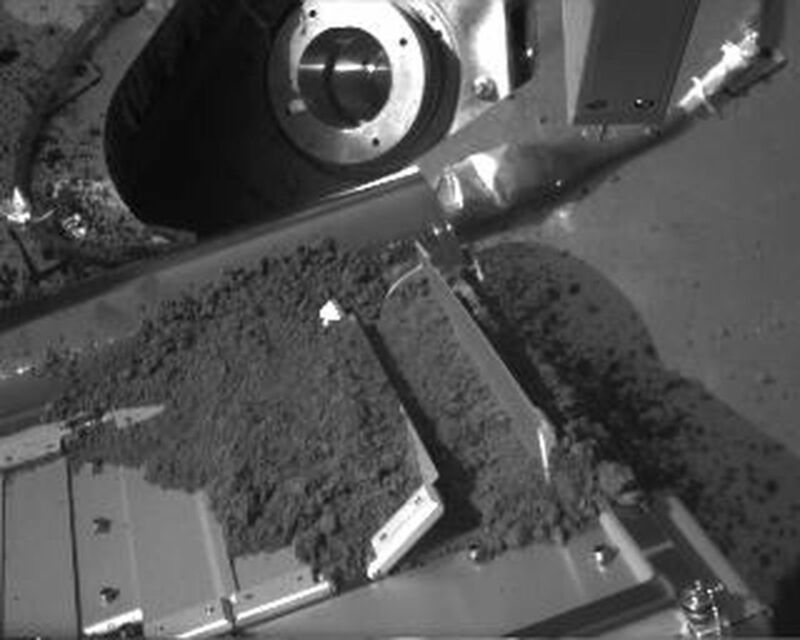 The screen is covered with soil in this pair of images, but visible in a view from about the same angle taken before the soil was delivered, at PIA10769. For scale, the doors are about 10 centimeters (4 inches) long. The "before" image here is the one in which the circular feature near the top of the image is more brightly lit. 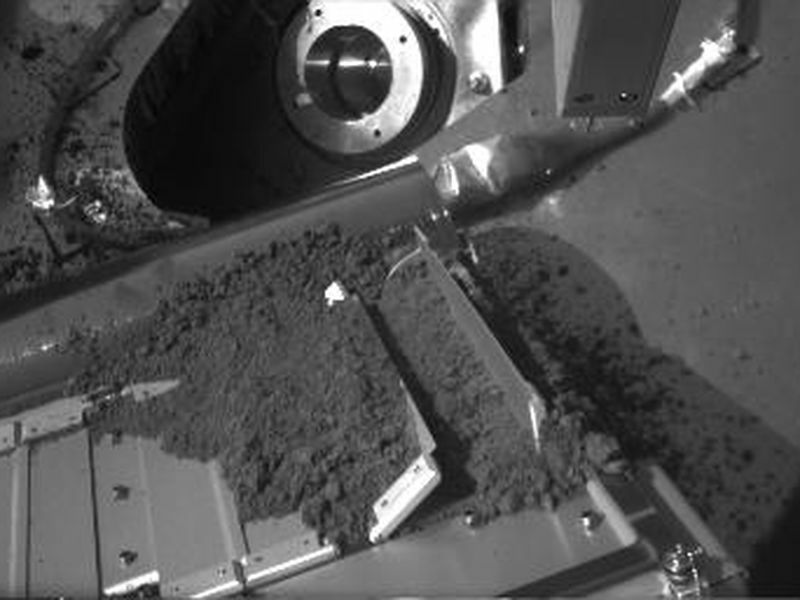 In the image taken after about seven minutes of shaking, the soil resting on the screen has slumped almost imperceptibly downhill. A dark gap about 3 millimeters (one-tenth of an inch) wide opened at the top edge of the screen.